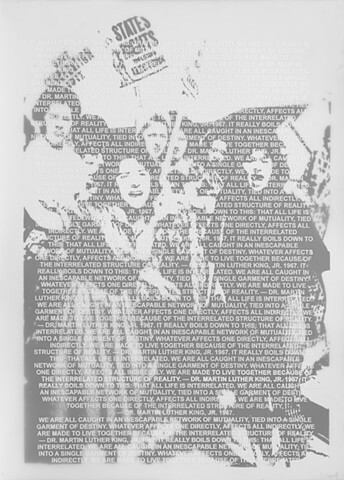 Whitewash: The Coverup - "The Cheerleaders"
Printed on Paper is a photograph of women (referred to as "Cheerleaders") protesting school desegregation in in New Orleans, LA, in 1960. Printed on vellum and superimposed is wording from Dr. Martin Luther King Jr.'s "A Christmas Sermon on Peace", 1967. "....We are all caught in an inescapable network of mutuality..."